Everyone who was at that Lucha Underground taping raved about the casket match as if it was a match of the year. Not simply a Lucha Underground match of the year, but worldwide. The reactions for the Lucha Underground matches lean positive, but this was mentioned as being a notch above everything else that’s been raved about. The 5:15 start time appears to be the AAA start time going forward. It’s been that way for a few weeks now. It’s a lead to LigaMX coverage, so it seems to be an upgrade in exposure and means they’re unlikely to be starting late (as they had been on the old spot.) It would be even better if Televisa would just give them that extra 15 minutes so they could start on the hour. AAA’s also the second week of a two week taping, so those are locked in as the matches. Best bet is Angel de Oro vs Hechicero is CMLL’s free lightning match of the week, but no idea. That’s 2 Angel de Oro singles matches in a week. IWRG Wedneday shows haven’t been airing of late. 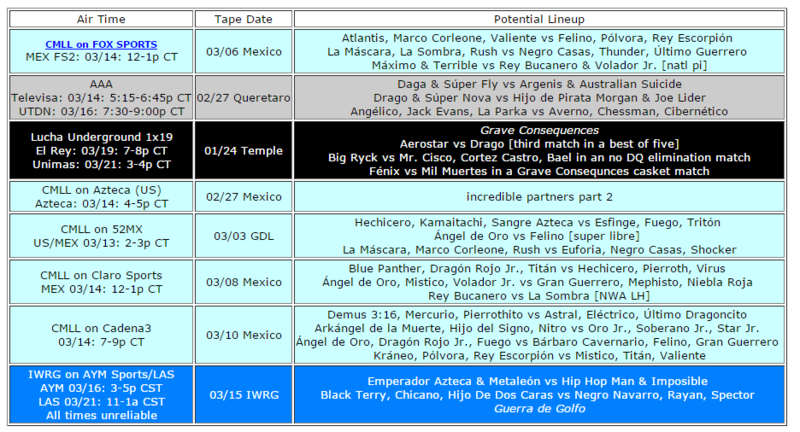 Leyendas Inmortales should be on the remainder of the 02/02 show, w/Casandra & Rossy Moreno vs Miss Janeth & Tania and Hijo del Dr. Wagner Jr., Hijo del Fishman, Mr. Jack vs Canek Jr., Hijo del Solar, Solar I. They’ve listed way too many shows as TV tapings to actually air them all, so they could skip around at any point. Lucha Azteca is listed at 4pm today. Tomorrow, who knows. Ninja Turtles/photo by Black Terry Jr.
IWRG win two back after losing the cage match. Black Terry Jr. has highlights of the show. IWRG also announced the 03/18 show will be another FILL show, including a 24 person cage match with wrestlers from the local school, from Gym Metropolitano and Gym Zeus. Those are Super Pinocho and Oficial 911’s schools. Rey Misterio Jr. appeared on Wrestling Observer Live yesterday. When asked about his AAA status, he said he agreed for a few dates and hasn’t signed on for that. He’s said the same in other interviews. The newsletter itself reported Mysterio debuting in Lucha Underground next weekend as a certainty. The AAA press conference implied he was back for a lot more than that and it may end up that way. Alberto said the same sort of things when he first returned to AAA and may have not signed a contract until just before he started on Lucha Underground. I still assume the same thing is going to happen here, with Rey Mysterio Jr. officially signing sometime in the next 10 days and starting on Lucha Underground next weekend. It’s also possible he’s signed, but they’re just trying to keep it quiet so Lucha Underground gets to make that big announcement. We’ll probably know for sure around 9pm CT next Saturday. Kamaitachi told MedioTempo he wants to be the best Japanese ever in CMLL. He’s 100% sure he’s winning (and breaking the run of non-success by Japanese, he notes.) Kamaitachi said he didn’t understand the Mexican style at first and it took a while for him to get a hold of it. Kamaitachi learned Dragon Lee could fly and hit very hard, which pleased Kamiatachi and they became rivals after that. Mesias says he’s not allied with anyone, but was angry about being lost in the shuffle in AAA and not being programmed in big matches, ones he feel he earned. Mesias explains he did not trust Konnan & Cibernetico’s offer to join them, figuring it was just another one of their tricks. Mesias’ feelings changed when Demon & Parka didn’t trust him in their trios match, which Mesias felt was disrespectful and proved the rudos were right all along. Myzteziz says he’s a luchador who’s always helped other luchadors, and now he’s like to help his brothers join him in a main even trio. Myzteziz says the Roldan’s did not totally reject this idea. That was kind of them. Argos doesn’t seem to be getting many bookings with AAA, working only in some shows Myzteziz main events. Dropping Consejo as an ongoing group has turned the non-Texano/Fantasma members into very part timers. CMLL Informa aired last night. The Daylight Savings Time delay makes it harder for me to work in, the feed not working when I tried to check it made it kind of impossible. It definitely was working later, but I had moved on. Scanning thru the news sections, there’s not much news: they did mention Mascara Dorada (and his feud with Kenny Omega) and they are still taping Puebla in HD despite not apparently airing it anywhere. Someone’s got to ask them where we can watch Puebla one of these weeks. The start of the show called the Panthers vs Virus/Tiger/Puma as match of the week. CMLL now lists Hombre Bala Jr. & Super Halcon Jr. in place of Fuego & Pegasso on Tuesday’s show. CMLL’s story on Amapola & Silueta to Japan mentions they’ll be working a second show on April 5th and then returning on April 6th. There’s also a look back at past Homenaje a Dos Leyendas; this year is the 20th, if you use some retroactive inclusion. DoradaFan has a music video of 12/23/2014 CMLL, a terrible show. Video interview with Terrible on Dos Leyendas. Hijo de Fishman says his focus in Sunday’s cage match is to protect his mask. Quick bio of Coahuila’s Metal Flash.